When Lions quarterback said last week that the Lions might be tougher to cover without retired wide receiver Calvin Johnson, it sounded like the thing a quarterback has to say. But Johnson, at least, believes he has a point. The former Lions wideout suggested that others might not have always taken advantage of the double-teams he drew, and the element of mystery could work to their advantage. Johnson still led the Lions with 1,214 yards on 88 receptions last year, showing it wasn’t his play that was holding them back. They added wide receiver Marvin Jones in free agency, and they’re hoping they get more from tight end Eric Ebron, but at the moment, being better without one of the best wideouts in the recent history of the NFL seems more like a wish than a plan. 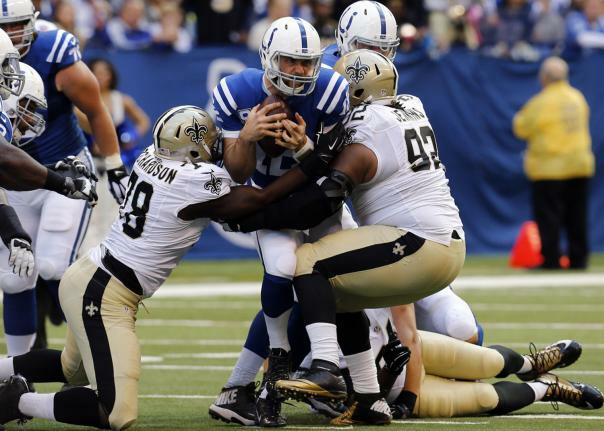 Last season was ugly for Colts quarterback Andrew Luck. This season, the Colts believe they can keep him healthy and effective by making him a moving target for opposing defenses. According to the Colts’ website, there are more rollouts in the playbook this season, and Colts coach Chuck Pagano says that he, with a defensive background, is excited about the way that can attack an opponent. “That’s tough from a defensive standpoint because it’s hard enough covering for two and a half, three seconds. Now when you extend a play, and a guy you think he’s going one way and everybody breaks a different direction it’s tough,” Pagano said. Colts backup quarterback Scott Tolzien, in his first year in Indianapolis, has seen how rollouts can work in other offenses and likes the wrinkle in the Colts’ offense as well. Keeping Luck moving may be the thing to keep him standing for 16 games. Is Broncos outside linebacker Von Miller using Instagram to let G.M. John Elway know that he’s not happy with the status of contract negotiations? That’s the inference from some who saw this picture on Miller’s Instagram showing himself, coach Gary Kubiak, Peyton Manning and DeMarcus Ware at the team’s White House visit this week. That picture originally appeared on Ware’s Instagram and also included Elway. Some saw the way Elway was cropped out of the picture on Miller’s Instagram as a sign that Miller is unhappy with Elway. And Miller probably is unhappy with Elway right now. Miller wants more than $70 million in the first three years of his contract, and Elway isn’t willing to give him that. When you ask for what you think you’re worth and the boss counters with less, it’s only natural to be disappointed. So Miller’s cropping of the photo was probably intentional, and probably indicative of his feelings right now. 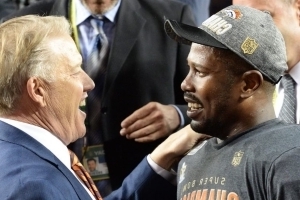 And if Elway plays hardball with Miller and tells him to play on the franchise tag or not at all this season, it may be a long time before we see a picture of Miller and Elway smiling together again. Redskins wide receiver DeSean Jackson showed up for organized team activity (OTA) practices Monday, per a picture posted on the team’s Twitter account. Jackson had stayed away from the team for the first two weeks of OTA practices, which are voluntary. Jackson had also volunteered to stay home for parts of May and June work in previous seasons as well. The Redskins, understandably, have to be anxious to see Jackson on the field. 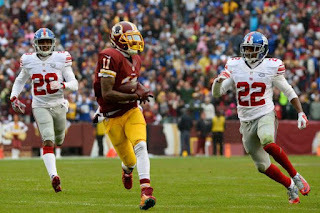 Expectations are high, and with quarterback Kirk Cousins likely to play under the one-year franchise tag and Jackson carrying a $9.25 million salary cap number in the last year of his contract, it’s a big year for a lot of reasons. Jackson, 29, is entering his third season with the Redskins. Injuries limited him to nine games and a career-low 30 receptions last season, but he’s still one of the league’s most dangerous deep threats when healthy. The Redskins are starting their final week of OTAs and have a mandatory minicamp next week before breaking until training camp.